 When I was a new mother of an infant son I went into a Ben Franklin store and opened a box of Crayolas and inhaled deeply. I thought of the day I would buy crayons for Landon. I have always loved the smell of Crayolas, probably because I loved school. I liked learning, although I didn’t think of it like that back then. I have two boxes of Crayolas in my office today. I don’t color with them, but I smell them on occasion, and they transport me to carefree coloring book days of long ago and the first day of school. Years back I was assigned to write a coloring book for Barbour Books. 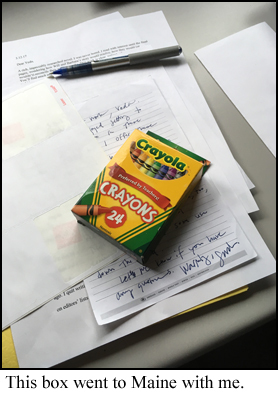 When it was released, I gave a copy to a friend, and she gave me a box of Crayola crayons­­­­­­­­––96 crayons. It even had silver and gold colors, which I had coveted back in the day from young friends who had a box of 48. I had never had more than a box of 12 in my life. That was on the school list of required supplies, and my folks didn’t have the extra money to splurge on nonessentials. 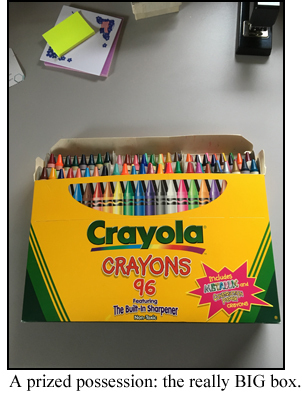 When I started this MFA grad school, our son Marshall (probably Abby’s idea) gave me a box of 24 Crayola crayons. I took them with me to Maine and smelled them in my room. They smelled like a new beginning. I may take them back with me this summer when I go for the ten-day residency and my graduation. Now Crayola has decided to give up the color dandelion. It’s one of my favorites. I thought that gold crayon was magnificent until I compared it to dandelion. I think dandelion was called maize in my youthful boxes or maybe even yellow-orange. 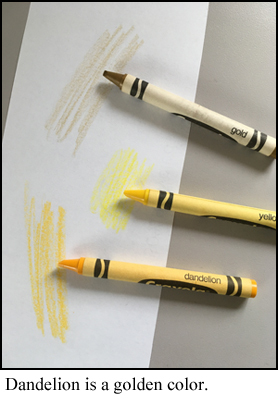 The yellow crayon is what you’d traditionally think of as yellow on the primary color wheel, but dandelion is truly golden, not a sort of brownish color like the gold crayon. I know some of you will argue with me, and I put my gold wedding band beside the gold color, and the lab folks at Crayola did a good job of matching it. Still, the color dandelion shines and shimmers and dances on paper. It’s the color of afternoon sunshine. It’s the color of goldfish. It’s the color of the harvest moon. It’s also the color of a bright dandelion. The folks at Crayola named it well. Both my boxes have dandelion in them, and of course I intend to keep them, not because of their so-called collector’s value, but because I love the smell. Crayolas rank in my favorite smells right below 1. freshly cut grass and right above 3. a cuddly baby (as opposed to a crying-in-need-of-a-diaper-change baby) 4. baking bread and 5. popcorn in a movie theater. Smells transport me to a special memory. What are your favorites?